(Health.com) -- You've probably heard eating more fish is good for you. But if selecting and preparing fish feels like entering uncharted waters, you're not alone: Most Americans eat very little fish compared to chicken and beef (just under 7 pounds a year vs. more than 100 pounds, according to the United States Department of Agriculture). Still, adding fish to the menu has a lot of benefits, especially for your heart. "Eating fish is the single best dietary change you can make to reduce your heart disease risk," says Dariush Mozaffarian, MD, co-director of the Harvard School of Public Health's Program in Cardiac Epidemiology. Why? Cooked fish is a great source of omega 3 fatty acids, which protect the heart by lowering triglyceride levels -- too many triglycerides in the blood can help clog your arteries leading to coronary heart disease. Omega 3s can also lower blood pressure and decrease the risk of heart arrhythmias, which can lead to sudden cardiac death. Eating omega 3-rich fish appears to have a greater impact on the heart than consuming either plant or supplement sources of the fatty acids. In fact, women who eat fish at least one or more times per month can lower their risk of death from coronary heart disease by up to 34 percent, according to the largest U.S. study of women's health and dietary habits. Heart disease is the number one killer of women. Fish also is a great source of lean protein, low in saturated fat, and provides other essential nutrients such as iron and vitamin A. 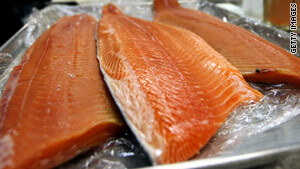 Although most fish naturally contain omega 3 fatty acids, oily fish (such as salmon, herring, and trout) are the richest sources, and the American Heart Association recommends healthy people consume two 3.5-ounce servings of cooked fish per week, which provides approximately 500mg of omega 3s per day. Some farmed fish like tilapia and catfish have significantly lower levels of omega 3s than their wild counterparts, a recent study by researchers at Wake Forest found. Experts say you should choose wild-caught species whenever possible. Try canned products, which are relatively inexpensive. Some canned varieties like salmon may include the bones and will give you an extra calcium boost as well. Just keep an eye on the sodium count if you are trying to watch your blood pressure, and avoid especially salty preparations such as smoked fish. Experts say the cardio-protective benefits far outweigh the risk of exposure to toxins, and eating a variety of fish can help minimize this risk. However, the FDA warns that pregnant women or those planning on becoming pregnant, as well as children under the age of 12, should avoid larger fish that tend to be especially high in mercury (e.g. shark, king mackerel, swordfish, and tilefish). You can also make sure your fish is eco-friendly by asking the origin of your seafood, says Ray Hilborn, an aquatic and fishery sciences professor at the University of Washington. Look for specimens certified by groups like the nonprofit Marine Stewardship Council. Or check out the Seafood Watch list (available as a free iPhone app). When cooking fish, keep calories in check by broiling, grilling, baking, or steaming it instead of frying. Fresh herbs, spices, and/or citrus contribute great flavor without an excess of sodium. Try experimenting with different tastes -- add an Asian flair with a gingery teriyaki glaze or go Mediterranean with a creamy cucumber-dill sauce made with low-fat Greek yogurt. Grill an extra fillet or two and toss leftovers atop a spinach or mixed green salad. You can even make your own vinaigrette with extra-virgin olive oil, which contains cholesterol-lowering monounsaturated fatty acids. 2. Sprinkle salt and pepper over both sides of fish. 3. Place fish in a single layer in an 11- x 7-inch baking dish coated with cooking spray. 4. Combine tomatoes and remaining ingredients in a bowl; spoon mixture over fish. 5. Bake at 425° for 22 minutes.